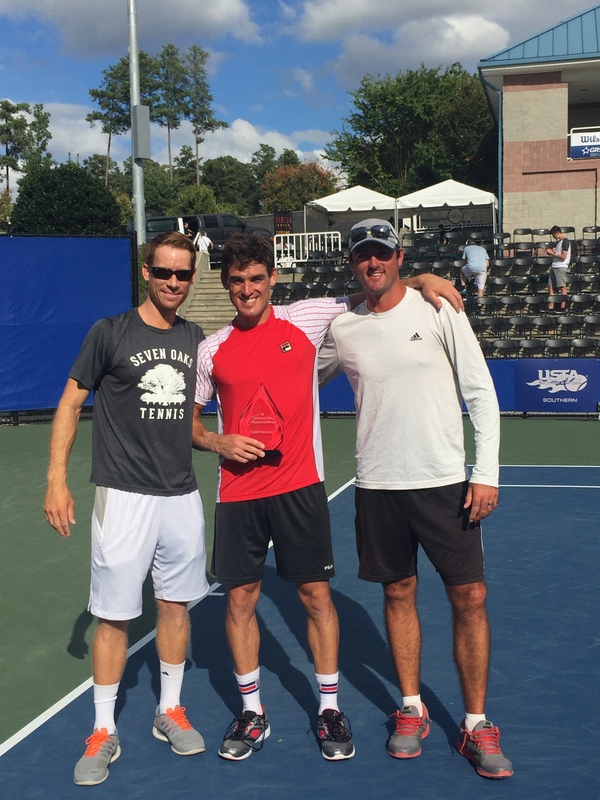 Following a great week last week where I bagged my first ATP Challenger title in Cary North Carolina, I’d like to fill you in on the story behind what is a milestone moment in my career. It’s funny how it all came about but I wasn’t even meant to be playing Cary Challenger! Just a few weeks before, I had qualified into Winston-Salem ATP 250 event and it was there that I chose to play 3 events in China next. I went online to enter 3 events (Nanchang Challenger, Kaohsiung Challenger and an ATP event in China) and called a friend who coaches in Singapore to see if he could help out one of the weeks in China. He agreed and I went straight into making travel plans, hotel bookings and preparing all the logistics behind the trip. The final thing to sort out was applying for a Chinese Visa and I’d be set. ”Easy” I thought..
A week after applying for my Visa and going through all the administrative details of paperwork, invitation letters, head shots etc. I woke up to a phone call from the Chinese lady I spoke to at the Visa Office. ”Uh, sorry sir but your Visa has been rejected.” I thought she was actually joking as she sort of laughed as she said it but after 20 minutes of questions and answers, I came to learn that there was a G20 Summit in China at the time and apparently the Chinese Consulate in Houston was rejecting applications for foreigner Visas. The timing couldn’t have been worse and there was nothing I could do about it. Thankfully, I still had the option of playing a different tournament that week so I decided to sign-in to play the qualifying of Cary Challenger. It was just a 6 hour road trip up from Atlanta so myself and my friend Julian Bradley rented a car and headed up there Thursday morning. 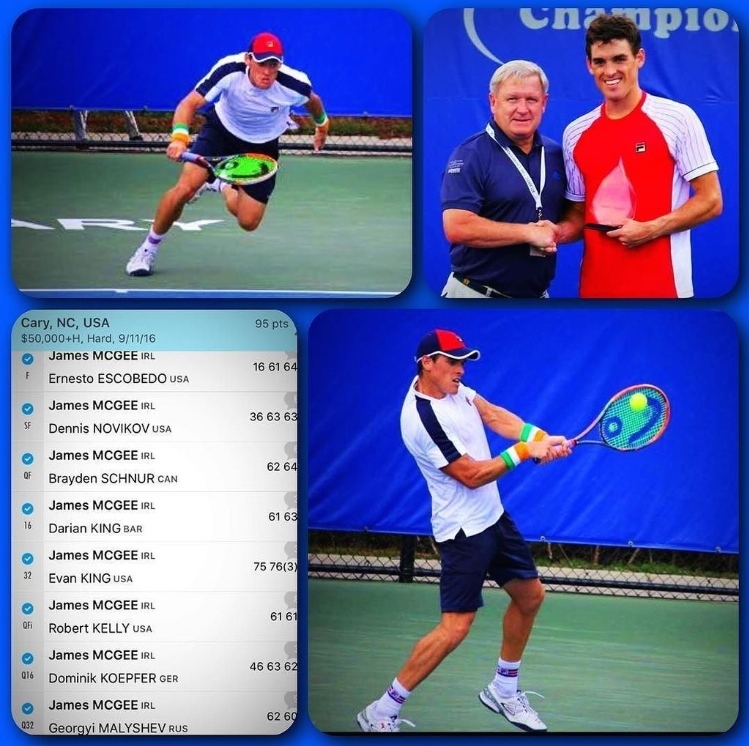 I was the 1st seed in the qualifying event and played my first match on Saturday afternoon on Stadium Court in Cary. I struggled with the feel of the ball and the court surface at first but knew I could work my way into it. I came through my qualifying matches after playing 3 current and former college tennis players and drew another former college tennis player in the first round of the main draw, Evan King. Evan is a great guy with a big lefty serve and I managed to come through that match, although neither of us played our best tennis on the day. 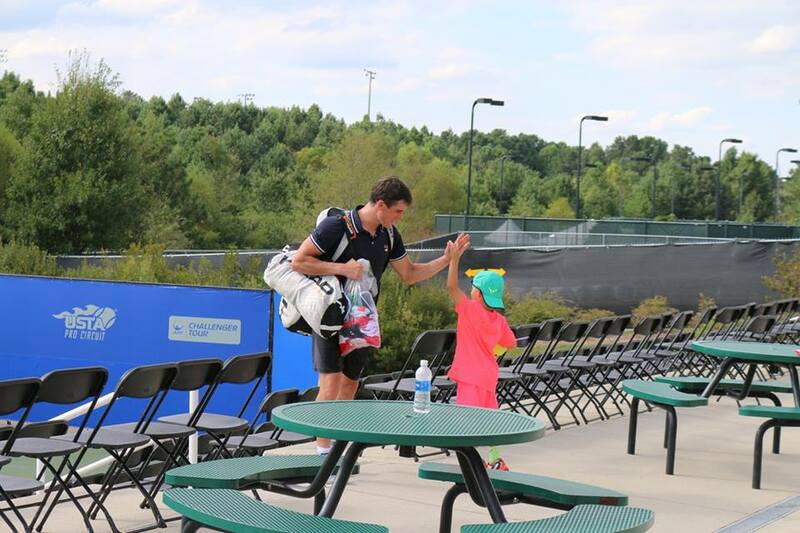 I went on to beat the number 6 seed, Darian King followed by a quarter-final win over Brayden Schnur, who had some local support as he is a former UNC Tar Heel. High 5’s flying all around! I went on to win a tight 3 set semi-final over the #1 seed Dennis Novikov before playing my first Challenger final of 2016 against the up and coming American Ernesto Escobedo. 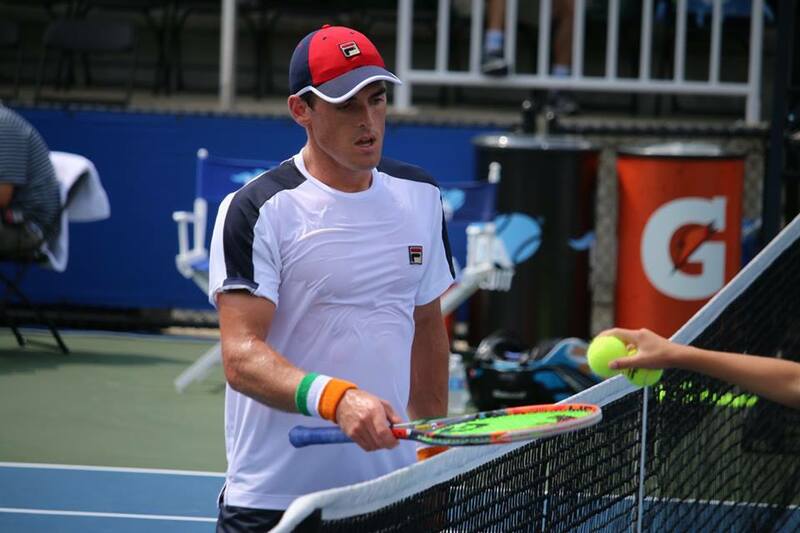 Ernesto had already won a Challenger this year in Lexington and I was aware of how dangerous his game is-huge serve and an explosive forehand with incredible power. He outplayed me in the first set but I managed to turn things around and win the 2nd set 6-1 before coming through a tense and tough 3rd set 6-4. It was such a thrill to finish the match with a forehand winner crosscourt and to realise I had finally won one of these Challengers! I kept smiling all through the ceremony and afterwards with my friends as it meant a lot to me. I jumped in the rankings from #257 at the start of the week to #194 after the win and it has put me in good stead for the rest of the year as I am in a strong position to keep climbing without defending many ATP points. I’ve made good progress the last few months considering I was ranked almost 370 at the start of July and I have to thank the people who have helped me in Atlanta as well as abroad-notably Jason Parker, Joseph O’ Dwyer and Nick Cavaday. I also want to thank the people who supported me online and offline during the week and for the constant messages of support. Thanks to this support, I am back to my best. I’ve relied heavily on financial sponsorship down through the years and I am continuing to look for sponsors who can support me and allow me to compete on the tour properly without pinching pennies and cutting corners. I hope this win can generate some publicity for me and I can find some more sponsors to help pay for the costs on the tour. I would like to acknowledge my current sponsors and thank them sincerely for their support-Aer Lingus, Fila, Solinco, Head, Ding, CurraNZ as well as some private individuals. I am proud to be working with each company. 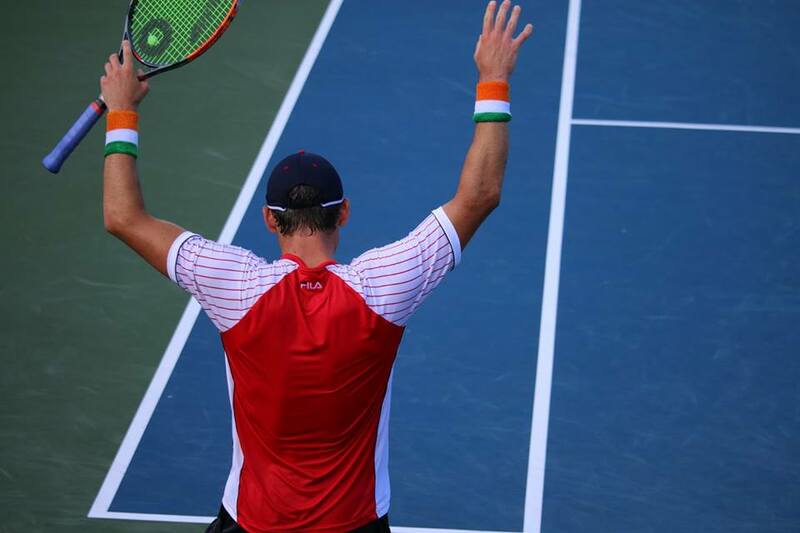 This entry was posted in ATP Tour, Challenger Tour, college tennis, General, Information, Irish Tennis, Sponsorship, Tour Life, Tournament, Update and tagged aer lingus, atp rankings, ATP Tennis, cary challenger, Challenger Tour, head rackets, Irish Tennis, James McGee, james mcgee blog, james mcgee facebook, james mcgee instagram, james mcgee ireland, james mcgee tennis, james mcgee twitter, life on tour, sponsorship, tennis, update. Bookmark the permalink. Onward and upward James . Well done.